In recognition of National Engineer’s Week (February 18-24, 2018), Mote & Associates, Inc. and the Greenville High School Engineering Tech Prep Class taught by Mr. Christopher Sykes and Mr. Adam Eberwein collaborated for the 10th annual “Engineer’s Week Challenge”. The Mote team mentored the students as they worked on their designs of a balsam wood ‘Boom Crane Structure’. Then they served as judges in the annual “Engineer’s Week Challenge” which consisted of the construction and breaking of the frames by different teams of students in the class. 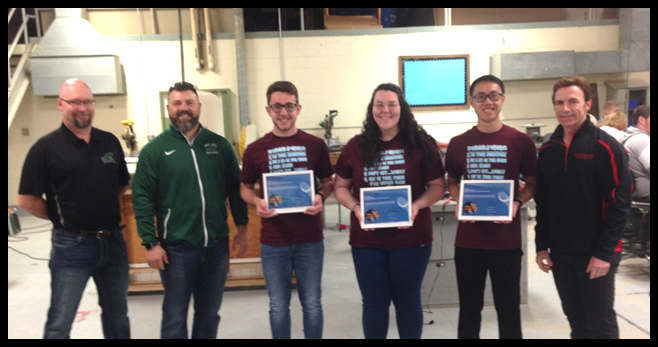 The team with the highest efficiency (frame carried the most weight in comparison to the frame’s weight) was declared the winning team. The winners of the “Engineer’s Week Challenge” (students Tyler Strait, Julie Rosenberry, and Alex Chui) and their teachers, Mr. Sykes and Mr. Eberwein, were rewarded with certificates and a gift from Mote & Associates. Participants from Mote & Associates included Jerry McClannan, Mitch Pitsenbarger, and Matt Venable. Mote & Associates is a Civil Engineering & Surveying Company located at 214 West Fourth Street in Greenville and consists of 20 employees. They also promote careers in engineering in other ways. They sponsor a scholarship in the spring (see www.moteassociates.com for details), encourage student mentorships throughout the school year, and hire engineering interns as warranted by their work load.